Item the first: My friend stopped by today to try on her Cheeky! pants. They fit her fabulously in the front, but the back needs some more short rows. And not where the pattern says to put them. That’s okay, I marked where I think they should go and I believe I can continue on without having to rip the whole thing out and start over, so yay! 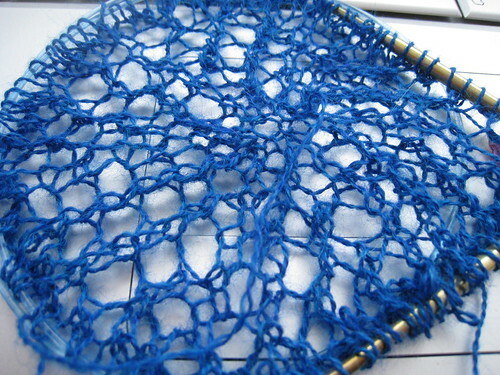 This part of the shawl is so much fun to knit! The pattern is simple, and it goes quickly because there are only a few stitches to knit. Item the third: I created a formspring.me account. Ask me anything and I shall attempt to answer in blog post form.